While I realize it’s not possible to truly see a city in 24 hours, no matter the size, it is possible to get a taste for it. Memories can be created in seconds, and I managed to create plenty in my 24 hours in Istanbul. Istanbul rose to become an imperial capital as a result of its strategic position along trade routes coming from Asia and Africa into Europe. Its colorful history is marked by three ruling empires – Roman, Byzantine and Ottoman, each having left an indelible mark on the city in the form of opulent mosques, decadent palaces and a diverse culture that continues to thrive to this day. I got my first glimpse of the city from Halic Bridge on my way into the city from the airport. 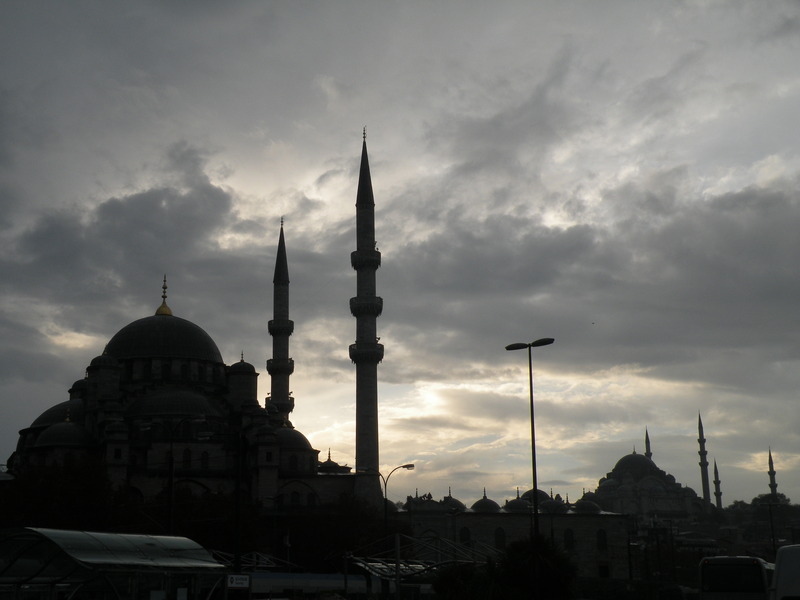 Across the Golden Horn, the skyline was dappled with the shadows of domes and spires reaching up into the darkness. These were the mosques of Istanbul, of which there are nearly 2,000. Our hotel was in the Beyoğlu District, the new European part of the city, which in certain areas is having a bit of a facelift. It’s the perfect base for those in search of shopping and some of the famous Istanbul nightlife. The maze of streets around the main strip, Istiklal Caddesi, is teeming with slick bars and traditional cafes, buzzing with cool locals and enthusiastic tourists. 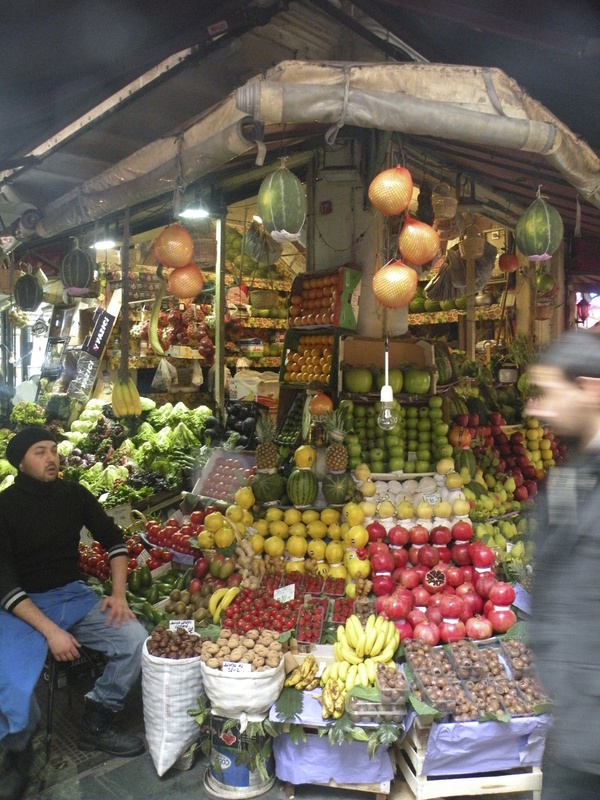 By night, Istiklal Caddesi is populated with partygoers, by day, shoppers take their place. The street is lined with a mishmash of shops; familiar high-street shops, specialized traditional shops, cafes and restaurants stand side-by-side, while an old-fashioned red tram chugs up and down tooting its horn announcing its arrival. This could well be a shopper’s paradise, however, my discovery was a bakery famed for profiteroles. Stepping inside was like stepping into the past. Think the scene in Charlie and the Chocolate Factory – the thin shop assistant in his sparkling white coat, pulling jars of sweets off shelves and silver trays laden with chocolate from polished glass cabinets. Here, the polished glass cabinet stretched the length of the shop, a man in a blue cotton coat stood behind, dishing up plates of choux pastry goodness smothered with a dark chocolate sauce. I was like a child trying to calculate how many I could shove into my mouth before the group moved on without me. A lady sat at the end of the room, sipping on a cup of steaming coffee, an old cashier in front of her. Neither of them seemed perturbed by my giddiness and indecisiveness, a sight I’m sure they’ve seen a thousand times. All it takes is a turn onto a side street and you find yourself in a maze of narrow streets and laneways crammed with fruit stalls, glass shops, scarf shops, fish stalls and whatever else you can imagine. 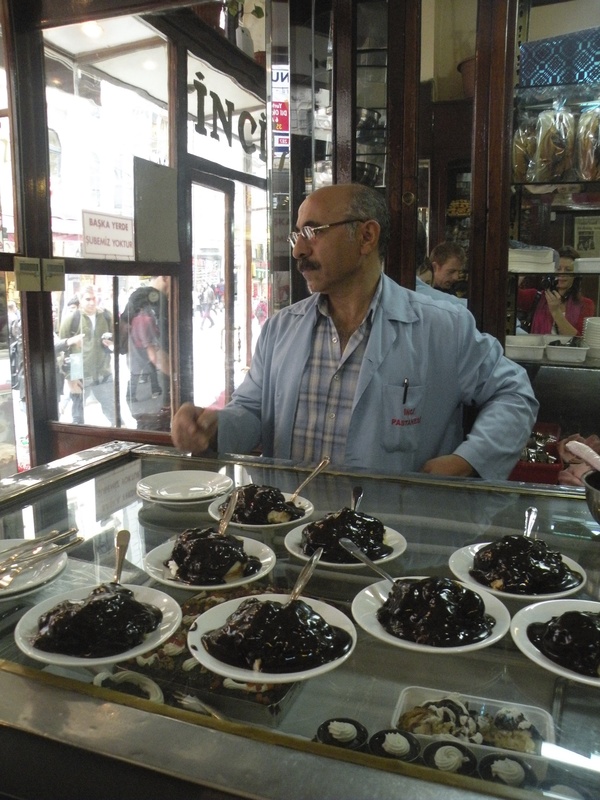 This is the old world of Istanbul – strings of specialized shops, set amongst small coffee houses, the smell of coffee and sound of chatter drifting onto the street. I wished I had time to browse the little shops with their colourful trinkets, scarves and quirky lampshades, but there was more to see and time was marching on. As we moved slowly through the streets, gradually descending towards the river, I began to understand the old saying – Istanbul is where East meets West. It is a city of old and new, European, Asian and African all merged into one. One moment I’d feel like I was in Italy, the next Vietnam and then I’d round a corner and be assailed with the smells and sights of Morocco. This is the charm of the city, with every turn you find yourself in what feels like another country. It’s familiar and foreign at the same time. There’s often a moment when you’re travelling, when something catches your eye and you have to stand still to watch and understand. For me, in Istanbul, it was not the mosques, the palaces, the bazaars, but rather a sight so unfamiliar and random I had to stop. 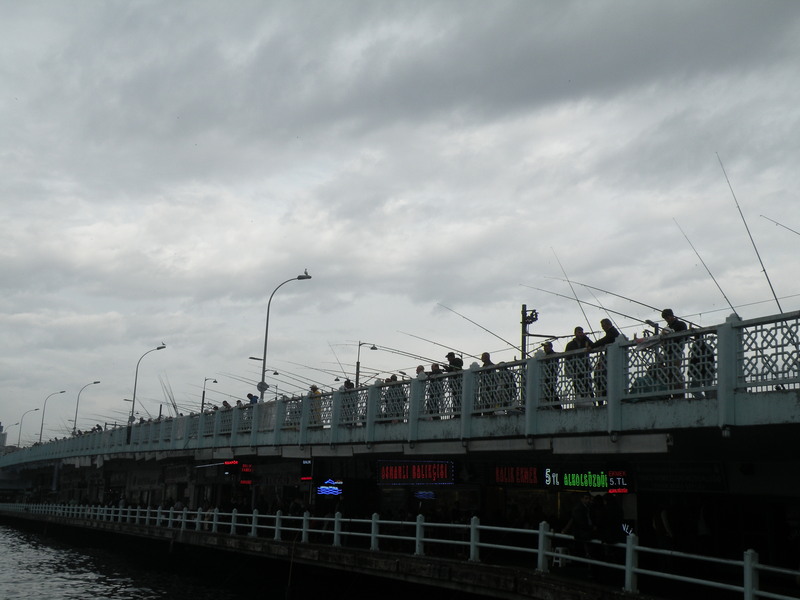 Draped over Galata Bridge were hundreds of men, fishing rods in hand, lines dangling down into the dark abyss known as the Bosphorous. I seemed to be the only one who was captivated by the sight of hundreds of men fishing off what seemed to be the equivalent of the Golden Gate bridge. Our guide explained, that no matter what time of day, 365 days a year, hundreds of men fished the murky waters, their catch either feeding their families or sold to local fish traders. I watched as they pulled up tiny fish and wondered how anything so small could feed an ant. This is why I love to travel, to see weird and wonderful things. Beside me were gaggles of fishermen and before me was the skyline I’d seen the night before. The domes and spires of the Sultanahmet district (Istanbul’s historic centre) looked just as spectacular by day as they had the night before. Istanbul has a lot to thank the Ottoman Empire for, they’d dragged the city out of its decay in the 15th century and restored it to its former glory, restoring Byzantine buildings and building magnificent mosques, some of the most spectacular of which reside in Sultanahmet. 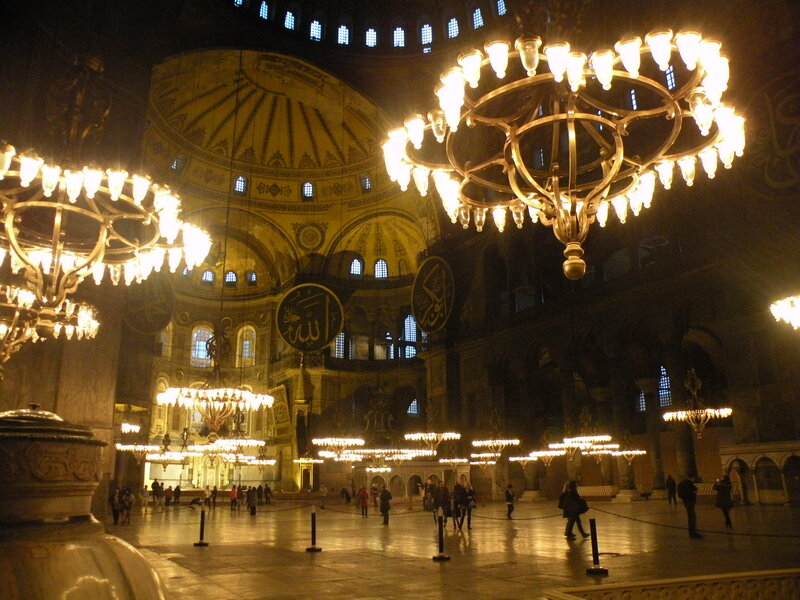 If you were to choose but one mosque to visit in Istanbul, visit Hagia Sophia. Originally built as a church in the 6th century, under the orders of the Byzantine empire, it became the religious focal point of the Eastern Orthodox Church. For over a thousand years, the Hagia Sophia held the title of the world’s largest cathedral. The roof rolls like a mountain, from one dome to the next, supporting brass chandeliers that hover like spaceships, the dim lanterns casting a shimmering light. Exquisite mosaics cover almost every surface, except for the slabs of marble on the ground. When the city was defeated by the Ottoman Empire, Hagia Sophia was converted to a mosque. Arabic symbols veil what were once images of Christian gods, some of which have been salvaged and the old faces are reappearing with on-going restoration. It is a sight to behold and continues to command reverence from those that cross its threshold, despite no longer being a place of worship. We were encouraged to put our thumb in a small hole in the wall and make a wish, something that we all knew was childish and felt a little out of place in such a magnificent place, yet we lined up to take our turn. I don’t think any words can do justice to Hagia Sophia, or at least my words, so I can only tell you, that it is not to be missed. The Sultan Ahmed Mosque (Blue Mosque) while less opulent, is magical in its own right. Its exterior is awe-inspiring and inside it is the 20,000 handmade ceramic tiles, the top tier of which are blue, that gives it it’s name – the Blue Mosque. Moving back towards the river, the crowds begin to thicken and the sound of the call to prayer resounds throughout the city. The streets begin to narrow and we navigate our way through the laneways of Fatih. 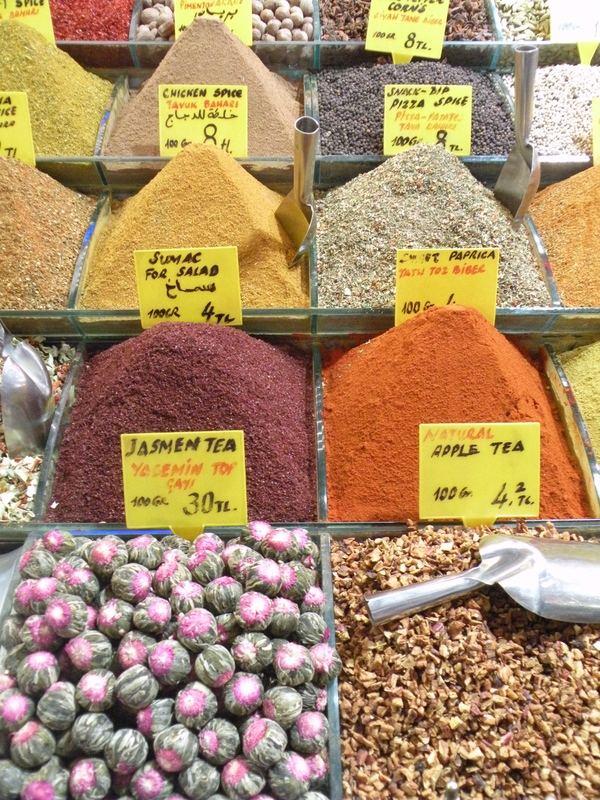 It is here you’ll find one of Istanbul’s largest bazaars – The Spice Bazaar, dating back to 1597. This is a market of colorful chaos. Neat piles of Turkish delight attract my eye. My Dad loves the stuff. After a quick purchase I move on, pausing at the spices, the colours and smells bringing me back to a square in Morocco. Spices, teas, sweets and the sellers vying for your attention. The bazaar is surrounded a labyrinth of narrow laneways, lined with tiny shops selling everything from slippers to plastic tupperware. The streets are thronged with locals doing their shopping, milling about, bargaining, eating in the small eateries interspersed between the stalls. This is Istanbul at its best. Hustle, bustle, colour and the sound of the call to prayer echoing above. Our final port of call, before leaving for the airport, was the Grand Bazaar. This is not to be missed, however, an hour is just not enough. It is one of the largest and oldest covered markets in the world and with 61 streets and over 3000 shops to browse you could dedicate a full day to the place. My advice? Know what you want – scarves, leather, silk and carpets are all good value and no matter what you do, haggle. and spend a morning at the Grand Bazaar. I’ll just bring an empty bag with me next time. Note: I travelled with Turkish Airlines to Istanbul and our guide was with Renk Travel. I stayed at Konak Hotel in Taksim – great location, contemporary boutique style hotel. Your article is just like perfect two days itinerary for Istanbul City. Unfortunately I have never been to Istanbul but I think my wish is going to be complete very soon. I will definitely refer your article while planning my tour.